A team of scientists at the College of Veterinary Medicine has received a grant to support studies applying human medical knowledge to dogs in the detection of breast cancer. Drs. 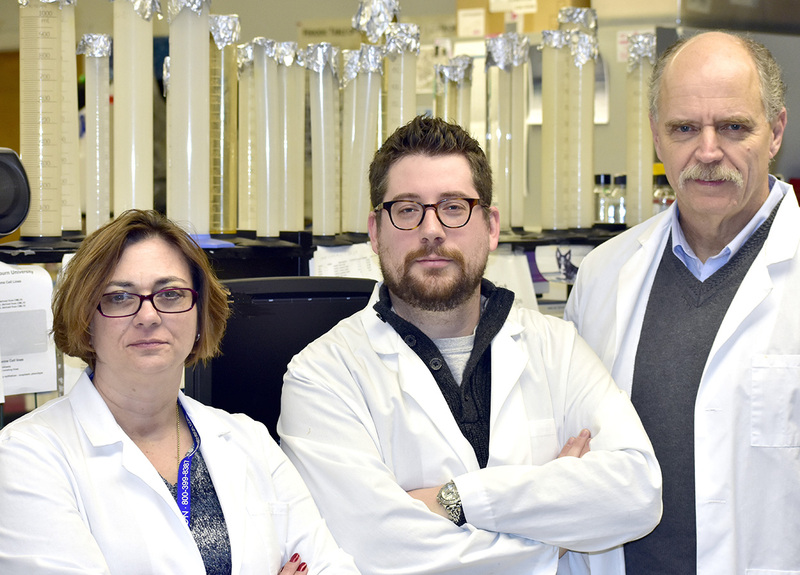 Annette Smith, Eric Fish and Curt Bird, left-right, are exploring if microRNA blood markers can be used to accurately detect breast cancer in dogs and also to predict how well patients will respond to treatment. Much of medical science derived for human treatment programs is based on earlier research involving animal models. A team of scientists at the College of Veterinary Medicine has received a grant to support studies applying human medical knowledge to dogs in the detection of breast cancer. Dr. Eric Fish, a clinical lecturer and doctoral candidate in the Department of Pathobiology, in collaboration with Dr. Annette Smith, the Lowder Distinguished Professor in the Department of Clinical Sciences, and Dr. Curt Bird, a professor in the Department of Pathobiology, recently received a $28,458 grant from the American College of Veterinary Internal Medicine (ACVIM) Foundation for their study titled, “Circulating MicroRNA as Predictive Biomarkers for Canine Mammary Neoplasia.” Their research explores if microRNA blood markers can be used to accurately detect breast cancer in dogs and also to predict how well patients will respond to treatment. Breast cancer is common among dogs — just as in humans — and the disease shares characteristics among both at the genetic level, according to Dr. Fish. The CVM team is building on the human research model to apply the science to dogs. The dog parallels well with the human breast cancer model, according to the CVM team. Although it is less common among spayed animals – particularly dogs spayed at an early age, which rarely develop breast cancer – “intact” dogs suffer breast cancer at much the same rate as do humans. Dogs possess a number of other characteristics that make the dog a good model for this research, according to the CVM researchers. The project has been underway for about 18 months, according to Dr. Fish. The team currently is working on its first peer-reviewed paper, which is on track to be published in early 2017. “The goal of the research is to improve the overall survival of breast cancer in dogs through earlier and minimally invasive detection of cancer, tumor recurrence and metastasis,” Dr. Fish said. “We are very pleased for the opportunity to perform research in the exciting area of microRNAs,” adds Dr. Smith, who was instrumental in obtaining the research grant. “These small molecules may provide clues to early diagnosis and prognosis in canine mammary tumors with just a small blood sample. The ACVIM Foundation exists to bridge the gap between available funding and the vital work that needs to be done. Because clinical studies in veterinary medicine are severely underfunded and receive virtually no government support, ACVIM specialists have long depended on the generosity of private donors and industry sponsors to support their research.